"Up, Up, and a Koopa"
Featured Song "What Goes Up May Never Come Down"
"Up, Up, and a Koopa" is the twenty-first episode of The Adventures of Super Mario Bros. 3; it aired alongside another episode of The Adventures of Super Mario Bros. 3 entitled "7 Continents for 7 Koopas". The episode's name is a pun on "Up, up and away" and marks the only appearance of P-Wings in the entire series.. In Toad's house, Toad is in the middle of cooking some food on his oven, which, after some stirring, he places in a bowl and gives to the nearby Princess Toadstool. Taking the bowl of food from Toad, Princess Toadstool glances at it and and says to Toad that she thought he was going to make her some bran; after saying this, the Princess gets the response from Toad that he was out of bran, but he did have some hay. As Toad explains this, Mario and Luigi, who are nearby, say that at least Toad's pancakes look edible and light and proceed to begin to eat the pancakes. As Mario and Luigi eat the pancakes, everything in Toad's house begins to rise to the house's ceiling, including Mario, Luigi, Toad and Princess Toadstool. Watching as his furniture crashes into the roof of his ceiling, Toad accidentally bangs his head on the ceiling and begins to wonder what is going on. Outside, the Doomship of King Koopa is flying through the air rapidly, blasting everything below it with a beam of light, with everything that is hit by the beam of light floating upwards. Onboard the Doomship, Koopa, along with Kooky von Koopa, are overseeing the havoc they are wreaking in Mushroom Land, with Koopa saying the Kooper-Dooper Raiser-Upper the Doomship is using is working perfectly and that soon, the Raiser-Upper will raise everything in Mushroom Land up to Sky Land; after Koopa announces all of this, Kooky goes on to say that he and Koopa also have Emperor Ed, the ruler of Sky Land, locked in a cage on the Doomship. Nearby, Emperor Ed, who is being guarded by a Rocky Wrench, begins to try to threaten Koopa and Kooky, saying that once his subjects discover he has been captured, they will revolt against them. Ed is ignored, and quieted by his his Rocky Wrench jailer. Koopa and Kooky continue to blast everything below the Doomship with the Raiser-Upper. Down below, everything in Mushroom Land is continuing to rise into the air as Mario, Luigi and Princess Toadstool, who are still inside Toad's house, look onward, confused. Elsewhere, on the Doomship, King Koopa, becoming somewhat impatient, decides to increase the power of the Kooper-Dooper Raiser-Upper; not hearing Kooky's objections, Koopa raises a switch on the device, causing it to malfunction and overload. As the Raiser-Upper shakes hazardously, the Doomship begins to rock back and forth, causing the cage Emperor Ed is in to fall over and be dumped out of a porthole of the Doomship. Sent tumbling through the air, Ed manages to safely land on a bed which was hit by the Raiser-Upper and after grabbing a nearby, rising teddy bear, crawls under the blankets of the bed, which is now descending to the ground. Onboard the Doomship, Kooky is alerting Koopa to the fact that Emperor Ed is gone and begins to get into an argument with him about how he wrecked his Kooper-Dooper Raiser-Upper. Irritated by Kooky, Koopa angrily commands Kooky repair the Raiser-Upper. Down below, everything the Raiser-Upper had made rise into the air is beginning to be lowered. Walking out of Toad's house, Mario, Luigi, Princess Toadstool and Toad begin to look around, with Mario wondering why everything had floated up into the air, only for Toad to reply that whatever the reason, at least it's over now. However, as Toad says this, a bed suddenly falls from the sky and Emperor Ed bounces out of it, landing on Toad. As Princess Toadstool asks if Toad is alright, Mario and Luigi help Ed to his feet; after being greeted by the Princess, Ed begins to frantically say that he and the Princess are in trouble, stating that Koopa had abducted him from his castle and plans to raise everything in the Princess's kingdom into his kingdom of Sky Land. Hearing Ed's story, Mario begins to say that he and Luigi should take Ed back to Sky Land and defeat Bowser. In a hilled area, Mario and Luigi are in the midst of bashing blocks with their fists, in search of Super Leaves, while Toad and Princess Toadstool begin to tie and hammer down everything they can, making sure that Bowser's Raiser-Upper won't affect anything. Grabbing the Super Leaves they discovered, Mario and Luigi transform into Raccoon Mario and Raccoon Luigi and proclaim that they will fly to Koopa's Doomship and destroy the Raiser-Upper while Toad and the Princess secure everything they can on the ground. 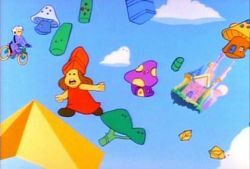 Up in the sky, Mario and Luigi are carrying Emperor Ed through the air; eventually, after being given directions by Ed, Mario and Luigi drop him on a tower of his castle in Sky Land. After saying goodbye, Mario and Luigi continue to fly through the air and notice a large amount of furniture and houses floating by them and surmise that Koopa is using his Kooper-Dooper Raiser-Upper once again. Nearby, on the Doomship, Kooky is in the midst of tinkering with the Raiser-Upper, which is continually firing a beam downwards. Eventually finishing his work on the Raiser-Upper, Kooky turns around and tells Koopa that the Raiser-Upper now has ten times its original power; glad to hear this, Koopa proclaims that now he can have some real fun with the Raiser-Upper. Outside the Doomship, Mario and Luigi are sneaking into a porthole of the Doomship, planning to attack King Koopa and Kooky from behind. Unfortunately, Koopa sees Mario and Luigi before they can attack him and pulls a nearby switch, lowering a cage on top of Mario and Luigi, which causes them to lose their raccoon abilities. With Mario and Luigi trapped and a Rocky Wrench guarding them, Koopa turns on a nearby television screen and forces the brothers to watch as he uses the Kooper-Dooper Raiser-Upper to decimate the Mushroom Land. Mario, enraged at Koopa, says that he will never get away with what he is doing, only to be taunted by Koopa, who says that nothing can stop him. In the Mushroom Land, Toad can only watch in shock as all the houses surrounding him, despite being tied to the ground, begin to rise into the air. Onboard the Doomship, as Koopa watches in glee at the destruction he is causing with the Kooper-Dooper Raiser-Upper, Mario attempts to bribe the Rocky Wrench guarding his and Luigi's cage, stating that if the Rocky Wrench lets him and Luigi out of the cage, he'll give it a Fudjie. Seemingly annoyed by Mario, the Rocky Wrench begins to growl at him threateningly as it is asked by Luigi if he can borrow one of its wrenches. After Luigi makes this request, the Rocky Wrench, clutching several wrenches, begins to throw them at both Mario and Luigi. On the ground, Toad and Princess Toadstool are running into the Princess's castle. Once inside the castle, they enter the castle's dungeon, with the Princess stating that somewhere inside the castle dungeon is a golden treasure chest that contains a treasure that could help her and Toad reach Sky Land and find Mario and Luigi. Aboard the Doomship, Koopa begins to state that perhaps he should quadruple the Raiser-Upper's power, ignoring Kooky's protestation that he probably shouldn't do that. Back in the basement of Princess Toadstool's castle, Toad is bemoaning the fact that he can't find anything in the Princess's cluttered basement. As the Princess begins to try and defend why she has so much junk in her basement, the basement begins to shake violently. As her basement begins to shake, the Princess, as well as Toad, notice that, after some of the junk was knocked away, a door was revealed. Rushing through this door, Princess Toadstool and Toad find a treasure chest, which they open, releasing a pair of P-Wings, which they grab. Princess Toadstool and Toad in their P-Wing (Raccoon) forms. After touching these P-Wings, both Toad and the Princess change into Raccoon Toad and Raccoon Princess and begin to fly towards the Doomship, with Toad complaining that flying is hard and also stating he must look ridiculous; hearing Toad's complaints, the Princess reassures him. Onboard the Doomship, Mario and Luigi can only watch in despair as everything in Mushroom Land begins to rise into the sky; nearby, Koopa orders Kooky to put the Kooper-Dooper Raiser-Upper on automatic, saying that, while he is up so high, he might as well conquer Sky Land. Going over to a nearby microphone, Koopa announces to the inhabitants of Sky Land below that he is their new leader; defying him, Emperor Ed, as well as all his subjects, yell their protestations at Koopa, who, after being informed by Kooky that the Raiser-Upper has been raised to chaos mode, begins to attack. Using the Raiser-Upper, Bowser begins to manipulate various objects, dropping houses on the clouds of Sky Land and flinging apples at all of the kingdom's Mushroomer inhabitants. As Koopa torments the inhabitants of Sky Land, blasting them with the Kooper-Dooper Raiser-Upper, Princess Toadstool and Toad sneak, unnoticed, into the Doomship through one of its portholes. Eventually, after sending several Mushroomers flying through the air with the Raiser-Upper, Koopa roughly drops them on to some clouds; after dropping on to these clouds, the Mushroomers, dazed, decide to surrender to Koopa, much to his and Kooky's delight. On the Doomship, Toad, after calling to the Rocky Wrench guarding Mario and Luigi, throws a large magnet on to a pipe attached to the Doomship's ceiling. After this magnet lands on the pipe, the Rocky Wrench is pulled through the air by its metal wrenches and becomes affixed to the giant magnet. With the Rocky Wrench defeated, Princess Toadstool goes over to Mario and Luigi's cage and releases the two, while Toad spots his house floating by the Doomship. Upon being alerted to the fact that Toad's house is nearby, Mario gets an idea and instructs Luigi, Toad and the Princess to help him move the Kooper-Dooper Raiser-Upper to Toad's house. Nearby, King Koopa begins to gloat to himself and Kooky about how he conquered Mushroom Land and Sky Land, only to be shocked when Mario, Luigi, Toad and Princess Toadstool float by him in Toad's house with the Raiser-Upper. Before Koopa or Kooky can react, they are suddenly flung backwards to the Koopa Kingdom by a blast of the Raiser-Upper, with Koopa blaming Kooky for the predicament they are in. With Koopa and Kooky gone, Mario and Luigi, using the Raiser-Upper, begin to lower everything that was raised into the air back to the ground and into the Mushroom Kingdom; when Mario finishes returning everything to normal, Luigi inquires to what he was doing before this chain of events started. On the ground, in Toad's house, Mario begins to tell Luigi that he was eating pancakes before he started floating to the ceiling. In response, Luigi, grabbing a large amount of pancakes, devours them all, saying he'll make sure he is heavy enough to not start floating again, a statement which causes Mario, Toad and Princess Toadstool to begin laughing. The mushroom heads imprinted on the bowl of hay are first magenta when Toad hands the bowl to Princess Toadstool, but turn white when everything begins to rise towards the ceiling. The color scheme of the Kooper-Dooper Raiser-Upper inverts to brown in zoomed out shots of it, but becomes pink whenever the screen zooms in on it. The design scheme also differs whenever the screen zooms in, for the Raiser-Upper appears to have much more buttons and a completely different lever (before Kooky upgrades it). The color of Toad's house changes between orange and purple throughout various shots. As Princess Toadstool comments about her about to hit the ceiling as the house ascends, the noticeable wall in the background behind Mario and Luigi is incorrectly colored as the sky, with the window pane floating in midair. This occurs again at the end of the episode when Luigi wonders what was going on before he was so "rudely interrupted". The path leading up to Toad's house unexplainably reappears right before Mario, Luigi, Princess Toadstool, and Toad walk out side to see all the commotion. Right as Emperor Ed lands on Toad after crashing to the ground, Toad's cap (visible from underneath Ed) is purple. Also, as Princess Toadstool questions if Toad is alright, Toad's voice is slightly deeper than normal. When Mario and Luigi are breaking blocks in the forest, the sound effects of them breaking are heard but they aren't breaking until the next shot. As the newly-upgraded Kooper-Dooper Raiser-Upper fires upon the Mushroom Kingdom a second time, Toad's voice can be heard but he is nowhere visible. The tractor beam firing from the Doomship is incorrectly coming from the upper deck (near the pipe) instead of coming from inside. The chocolate bar Mario uses to attempt to bribe the Rocky Wrench has no label on it before the camera zooms in on it. The bar of fudge instantly vanishes from the shot once the enraged Rocky Wrench lobs it's wrenches at Mario and Luigi. When Mario scoffs at the enraged Rocky Wrench for trying to hurt him and Luigi, the top of the cage is transparent, except for the few lines hovering above Mario. Toad's vest is almost a pinkish hue when he remarks to Princess Toadstool about how cluttered her dungeon is, becomes the original red, then becomes pink as the basement begins to violently vibrate. Albeit Princess Toadstool dubs it a golden chest hidden in the secret room of the basement, the chest first appears to be blue with a silver rim. Additionally, the pink "light" around the chest overlaps Princess Toadstool's hair when she opens it, with the silhouette of the chest being visible from behind her head. 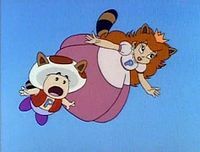 It is unknown how Princess Toadstool and Toad can glide with the P-Wings if they aren't moving their raccoon tails. The four speakers that emerge from hatches on the Doomship first appear to be in this order (according to shape): circle, circle, circle, triangle- but when Koopa offers the Mushroom people to surrender, the speaker shapes transform to: triangle, circle, circle, triangle. As King Koopa pokes his head outside the Doomship's porthole, the wood of the flying ship is slightly dark in color. In that same shot, King Koopa's left hand is missing a nail as he pokes his arm out the porthole. Emperor Ed's sash is mistakenly colored blue, the same color as his uniform, as he boycotts Bowser's rule against Sky Land. A very small portion of King Koopa's stomach is flashing onto Kooky's hair as he comments that the Kooper-Dooper Raiser-Upper has been fixed to chaos mode. The "P" on Toad's chest (after acquiring the P-Wing) is absent when Toad alerts the gang of the presence of his house floating nearby. As King Koopa gloats over the capture of both kingdoms, Kooky is oddly frozen for the entire shot. If everything has been placed back onto the ground as normal (including the house), it is questionable why the view outside the window in Toad's house is at a high altitude. The syrup on Luigi's pancakes is the same color as the pancakes as Mario reminds Luigi about breakfast. Additionally Mario incidentally has no pancakes on his plate before the screen zooms in, but has a large pile the shot goes to him and Luigi. As Luigi shoves the pile of pancakes into his mouth humorously, the syrup is not present on the pancakes. ↑ May 20, 2015. "Up, Up, and a Koopa", dubbed in Romanian by KidsCo. Odnoklassniki (OK.ru). Retrieved January 4, 2016. This page was last edited on March 31, 2019, at 15:14.